The 2nd edition of the IATA Security Management System (SeMS) Manual is now available to order. The goal of this updated material is to assist you in building effective aviation security measures through a standardised structure – the SeMS Manual is now recognised within SEC 1.1.1 of the IOSA Standards Manual, 12th Edition (click on the link to download a PDF of the IOSA Standards Manual (ISM) 12th Edition). • General updates, including categories of aviation security occurrences as well as the SeMS checklist. The IATA SeMS is being released at a time, when the 16th amendment to ICAO’s Annex 17 (Security) has come into effect (since 16 November 2018). One of its provisions requires aviation stakeholders to report “acts of unlawful interference and preparatory acts thereto”. 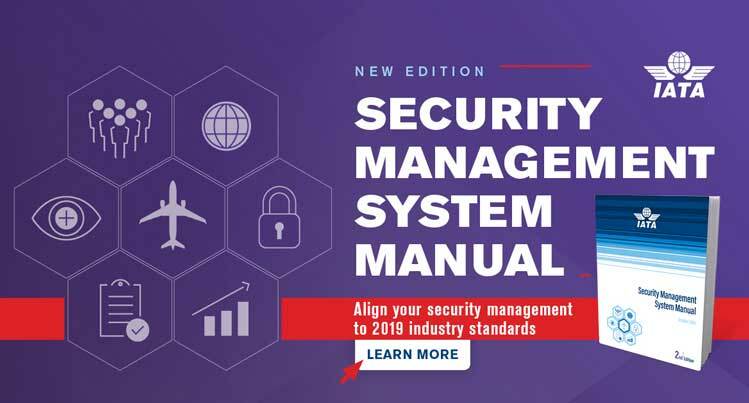 The IATA SeMS Manual enables you to implement a robust security reporting culture using the only industry agreed taxonomy, and be prepared and align your organisation to industry best practices in 2019. Browse the 2nd edition formats and choose the one relevant to your needs. Note: only the Windows version includes the toolbox feature with the threat assessment form, TRAM demo, etc. Security Management System (SeMS) allows airlines to take an integrated, methodical and responsive approach to their overall security. SeMS is logically based on the proven principles of Safety Management System (SMS). Correlations between SeMS and SMS illustrate a recognised link between safety and security priorities in the aviation industry. Enhances a company’s security culture, regulatory collaboration and resource utilisation. Provides guidance on implementing efficient, accurate and cost managed controls. Allows for optimum flexibility in the way entities develop and implement security, aviation security in particular, by easily integrating it into your business model. Supports a proactive, strategic and risk-based approach to protective security focusing on outcomes rather than on rigid compliance with directed requirements (where States allow this). Establishes a standard incident reporting tool reducing human errors and inconsistencies allowing for optimal benchmarking. Guideline on building effective aviation security measures. Improves overall performance and communication within a company, as well as with state regulators. Guidance to assist in the implementation of security-related IOSA Standards and Recommended Practices, including an interactive checklist with a dashboard feature. Continue your SeMS best practices in 2019 – order today. Questions about the new edition, content formats, or the ordering process? Please contact IATA Direct Sales.